Nobody wants to find out that the ‘dream’ Chevelle SS they spent hard earned money on was grandma’s grocery-getter inline 6 with a fresh coat of paint, instead of a highly desirable SS454 or the holy grail of Chevelles, the LS6. Thanks to VIN codes, this situation could be avoided entirely, ensuring that your money is well spent when it comes to your dream car. If you’re new to classic cars or are just looking to refresh your memory on how to decode your Chevelle’s VIN code tag, you’ve come to the right place. 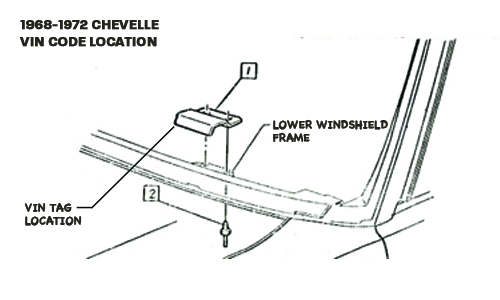 In this article, we’ll walk you through step-by-step on how to decode your Chevelle’s VIN code. Armed with this information, you can be sure that you’re getting the car of your dreams and not your nightmares! 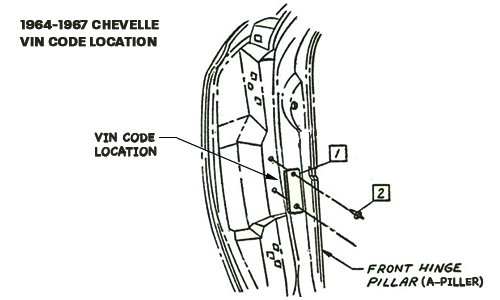 If the year of your Chevelle falls between 1964-1967 then the location of the VIN code tag will be on the driver sides front hinge piller or A-piller. After you locate your VIN code you’ll want to write down the thirteen digits that make up the VIN code. These numbers are critical to finding out all the information you’ll need on the history of your Chevelle. For an example code we’ll use Ground Ups 1970 Chevelle. The second and third character classifies the series designation. in our example the numbers are 3 and 6. This stands for Malibu and Concours station wagon, with an 8-cylinder motor. The fourth and fifth character classifies the body style and model of the vehicle. In our case the numbers are 6 and 7, which stands for a 2-door convertible body style. The sixth character classifies the year in which the car was produced. For us that number is 0, which stands for 1970. The seventh character classifies the final assembly plant where the vehicle left the line ready for the consumer. On our vin code we see the letter B, which stands for Baltimore, Maryland. The eight through thirteenth character classifies the sequential production number. Our vin code ends with the numbers 1 6 2 9 2 6. This tell us it’s a 1970 Chevelle and was the 62,926th Chevelle to roll off the assembly line.